A contemporary action story for children set in the gold-mining ghost town of Charleston, 30 km south of Westport. When 12 year old Tony and his nomadic mum arrive in Charleston, Tony is desperately hoping that this might finally be the place they settle down. He finds a unique e... read full description below. Set in Charleston, a gold-mining ghost town 30km south of Westport, Frog Whistle Mine is another of Des Hunt's trademark exciting, beautifully written contemporary action adventure stories for children, with ecological themes. Twelve-year-old Tony has lived all around New Zealand, travelling with his nomadic Mum, and desperately wants somewhere to belong. When they arrive in Charleston, he is almost afraid to hope this might finally be the place, but is desperate not to be disappointed yet again. 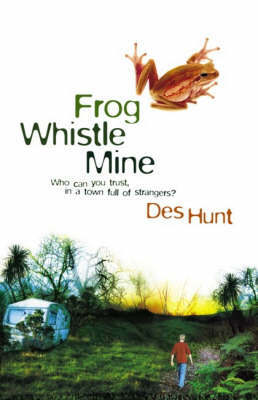 With a unique bush and coastal environment to explore, an interesting group of people to come to know - and a gathering mystery that starts from his very first night, when he finds out to his delight that he is to sleep alone in the bush in an old caravan...all the ingredients for a satisfying and exciting read are brought together, with some surprising outcomes. Once again, Des Hunt's educational expertise will be used to good effect, providing detailed teacher's notes to accompany the book.